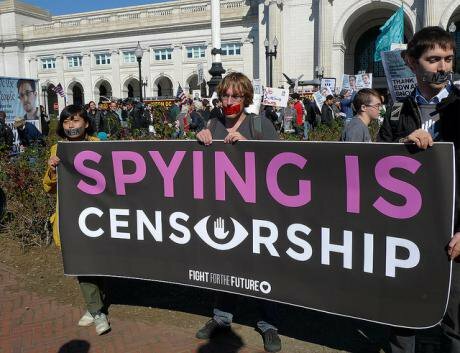 DC rally against mass censorship. Flickr/Susan Melkisethian. Some rights reserved. Jeremy Bentham’s panopticon prison design is the ultimate template of passive disciplinary power. With a viewing tower located at the centre of the complex, prisoners could be watched at all times and in all locations. With the inmates not being able to see inside the tower, surveillance could never be proven, only felt. The possibility of continued surveillance was enough to threaten, coerce and ultimately modify behaviour. In the digital age, surveillance is more opaque but the results are alarmingly similar. The Snowden revelations have highlighted the capacity of NSA and GCHQ to collate and harvest data from a range of digital platforms, as well as the desired aim to ‘collect it all’. This has brought to light a system that, due to its omnipresence, is able to target everyone irrespective of location, nationality or culpability. But with such a structure in place there is limited space for journalists to be able to investigate and question without fear of being watched. The dangers made apparent by mass surveillance do not only exist when their actions are felt; there may be no way of knowing you are being monitored, but conversely there is no way of knowing you are not. ‘If you feel someone's looking over your shoulder, there's all kinds of things you will not do…[You're not going to be] able to use facilities because of nameless fear.’ These are the words of Sir Tim Berners-Lee, creator of the world wide web. The nameless fear he identifies is similar to Bentham’s form of discipline – an invisible but tangible pressure that can disrupt or modify the actions of others without truly being present. The effects of such fear can be felt at every stage of the process, from investigation through to the consumption of media reports by the wider public. The continued capture and manipulation of metadata alongside the content of our communications also hollows out the ability for media bodies to meet with and protect sources. Jillian York of the electronic frontier foundation says, ‘The danger of metadata is that it allows the surveiller to map our networks and activities, making us think twice before communicating with a certain group or individual.’ Creating a narrative of its own choosing, ubiquitous mass surveillance transforms the act of communicating into the most dangerous act of all.